My wife will tell you that I am somewhat of an overprotective dad. But as I see my kids playing, I notice hazards and can envision them getting hurt. So I started working on a childproofing checklist to make sure that our home is safe in every room and that other families can use to do the same. It’s a comprehensive guide to baby-proofing the house with at least 50 ideas. Some you’ve thought of, and some you haven’t. And they’re all things, dad, that when you feel like you should be doing something but don’t know what to do when the new baby is home or you don’t know where your place is that you can do them. Were you aware that “Childproof” only means 80% of kids can’t open, use, or get inside of something? So even though our young toddler seems to be able to get any lid open, trying to at least slow her down is the top priority. Even the gate we used at family’s house to block the stairs had to continually be changed to adapt to what she had figured out. 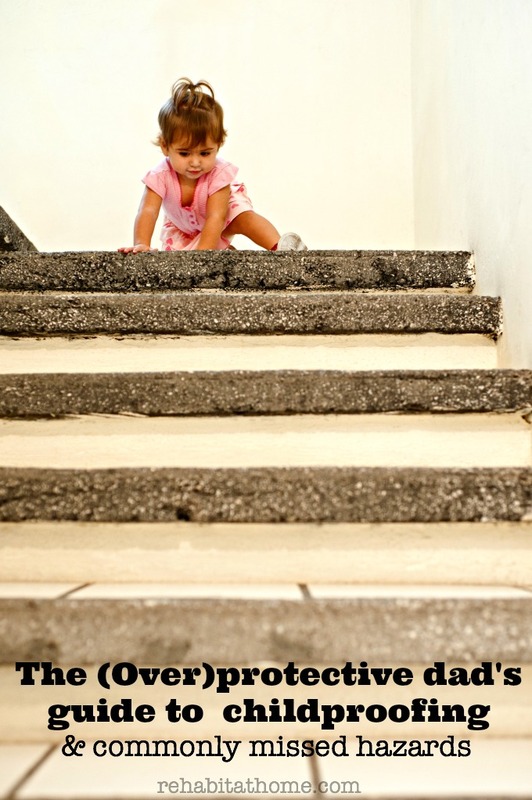 In general childproofing is an on-going and ever-morphing process. But there is still a great place to start to get the basics, including commonly overlooked dangers inside your home. Affiliate links included for your shopping convenience. Find Hidden Choking Hazards – Check around the baseboards and thresholds, especially if you usually sweep a pile to a certain place. Many times we have found our youngest with a choking hazard from stuff getting trapped while being swept away. Fridge Magnets – So many of them are tiny and magnets can pose a huge health risk to babies. Make sure you move them up really high or dispose of them altogether. Address your doorknobs – We discovered that kids can open lever doors at much earlier ages than regular twist door nobs. The danger here is that kids can lock themselves in a closet or get into a room that’s not appropriate or safe. You can add knob covers and yes, they do have lever knob locks! Electrical Receptacles and childproof caps – This one is probably the most common sense one on the list, but sometimes there are other ways that you can make your electrical kid friendly beyond the childproof caps. Because for us we found the caps actually encouraged our kids to pick at the outlets. Find five considerations to replacing electrical outlets here. Eliminating slipping and tripping hazards – Rugs, cords and other obstacles can become really serious as your baby gets mobile (which is sooner than you think). Get non-skid strips for your rugs and tub and make sure you’re not leaving out things like vacuum cords. Elevated Door Latch – Before our oldest daughter was even two years old she was standing on buckets trying to open doors. Consider putting a deadbolt or door latch at eye level, especially if you are installing new ones. This keeps your child safely inside. Especially for kids who like to follow their parents out, this is a way to prevent backovers and teach street safety. Fire mantel corner guards – Add even some pipe adhesive to the edges. Every mantle is different so there is not one-size fits all ready-made solution. Some people have used pool noodles, draped their mantel in a blanket during non-use seasons, and other ideas. Low VOC or no-VOC paint and furniture stains – This is applicable both to painting bedrooms and furniture. VOC stands for Volatile Organic Compound and is typically what causes things like toxic fumes. Leave them off of child furniture because even the most normal babies can still chew on cribs and furniture. Especially for brand new babies, you don’t want your paint to still be off-gassing. Water-based enamels on furniture – Just like using low and no VOC paint, if you have a DIY project for baby’s room such as refinishing a changing table, water based enamel is a safer option for your refinishing and repurposing projects because it’s not as toxic if (and when) your child chews on something. Carpet tack strips – Make sure they are properly covered. And even then make sure that crawling babies can’t get hurt or little walking heels don’t get poked. High trafficked areas can sometimes lead to tiny bits of the tack strip being felt and you don’t want your kids to get scratched without you knowing. 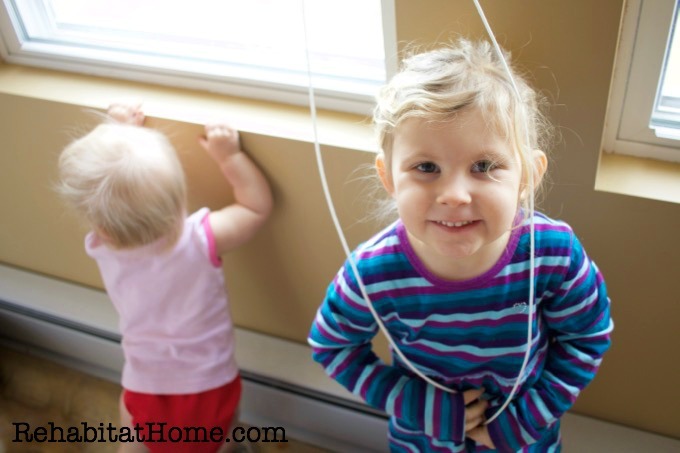 Tying down cords on window blinds – As babies and toddlers get older and their curiosity gets the best of them, cords can become dangerous choking hazards. The same goes for things like hanging dog leashes.